On 17 July 2014, Malaysia Airlines flight MH17 departed from Schiphol for Kuala Lumpur. On board were 283 passengers and 15 crew members. The aeroplane never arrived at its destination. Above the Eastern Ukrainian village of Hrabove, it was hit by an air missile and crashed. There were no survivors. Exactly three years later - on 17 July 2017 - the Dutch National Monument will be opened close to Schiphol. A memorial forest with 298 trees, one for each victim. Relatives of the victims jointly chose the design for a memorial forest at Park Vijfhuizen close to Schiphol airport, created by landscape architect Robbert de Koning. The forest takes the form of the black memorial ribbon that is often worn as a symbol for the disaster. Relatives chose a tree to represent their loved one(s) from ten different species, provided by Ebben Nurseries. The ribbon of trees rises out of the landscape in higher and lower slopes, like a three-dimensional ribbon in the park. Around the forest are thousands of sunflowers. In the middle of the memorial is an amphitheatre in which a monument will be placed, bearing all the victims’ names. Vijfhuizen, 18 March 2017. It’s typical Dutch weather, grey and wet. Ebben Nurseries employees arrive at the monument early in the morning. The construction work is not yet finished, but it’s easy to get a sense of how it will look. The shape of the memorial ribbon is visible, the planting locations are ready, the tree stakes have been installed and paths have been laid between the trees. The day begins with the planting of the first tree, a lime tree for the captain of flight MH17. In a short ceremony, outgoing minister of Foreign Affairs, Bert Koenders, the chair of the MH17 Disaster Foundation, Evert van Zijtveld, the Malaysian Ambassador, Ahmad Nazri Bin Yusof, and the Managing Director of Malaysia Airlines, Tan Sri Mohamad Nor Yusof, explained the meaning of the monument. Hope, memory, courage, glimmers of light and a living monument for all relatives and the next generations. A moving minute of silence falls when the first tree is planted. 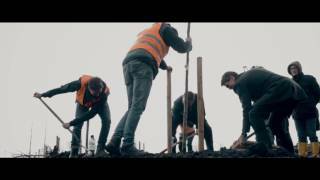 After the official part, the other 14 lime trees are planted for the crew of MH17. Together with the ambassador and the head of the Australian federal police, we plant 27 trees for the Australian victims. The relatives have now arrived. The trees are hoisted onto shoulders and carried to the monument through the ankle-deep marshy ground. At the monument, they are planted together with the relatives. So each tree has its own meaning, planted in a powerful symbol in order to grow to become an imposing memorial forest. All Ebben employees end the day with the same feeling: tired but mainly very satisfied. Full of awe, pride and gratitude. What an honour to have the opportunity to contribute to this monument together with the relatives.